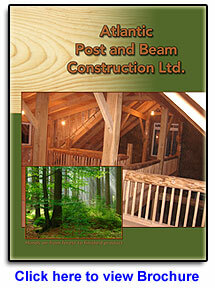 Atlantic Post and Beam Construction offers design and construction for residential and commercial projects. Prefabricated/Disassembled units can be assembled by an Atlantic Post and Beam Construction or you may do it as a Do-It-Yourself project by following an assembly guide provided. All prefabricated models are custom designed! The post and beam sizes and joinery will meet the building code requirements of the local authority and approved (stamped) by a professional engineer. Modular units are suitable when the client wants to have a rapid turn-key project with a relatively simple design. 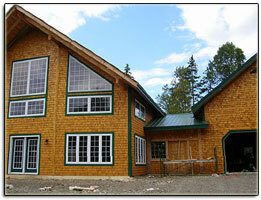 All of our prefabricated models are custom designed. Manufactured in a controlled environment, our custom design offers very flexible modular packages. Whether assembled by Atlantic Post and Beam or handled as a Do-It-Yourself project, the Prefabricated/Disassembled unit could be installed over a full basement wall, slab on grade or temporary piers at the project site. Slab on grade with in-floor heating system, wall and roof panel insulated with polyurethane foam, R value of R-33(wall) and R-40(roof). Owner preferred to integrate as much natural features as the design permitted. Most of the posts, beams and arch (curved) beams at the front of the house are from the owner's wood lot. © Atlantic Post and Beam Construction Ltd.